I entered this game with my save file carried over from ME1 and ME2, where I’ve chosen to make all the good decisions while being a renegade arse about it :P While I don’t think the decisions made much difference in this game, which is unfortunate, I like the way the characters I’ve kept alive were reintroduced to me as the game progressed. The graphics are wow. Really impressed. It isn’t as big an upgrade from ME1 to ME2, but it is noticeable and makes the game very beautiful. Better textures and lighting makes the game look great. The art in this game is fantastic too, Purgatory bar and an Asari monastery in particular made me stop and watch at how good it looks. 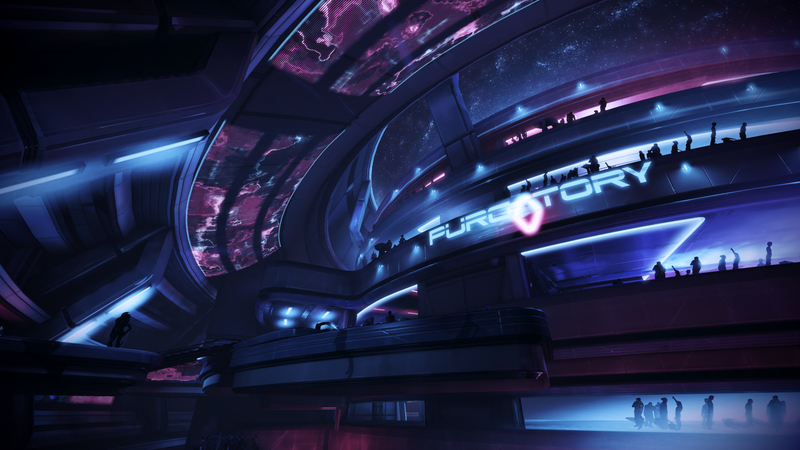 Talking of Purgatory, the music in Mass Effect 3 is really good; it holds up to the previous games. I’m surprised too, as the original composer Jack Wall didn’t make it. I wasn’t sure the new one Clint Mansell could achieve what had been done. There weren’t any stand out pieces in this unlike the last two (‘Spectre Induction’ and ‘The Normandy Reborn’, anyone? :D) but it was generally good. Wish there was a bit more retro/electro vibes though. Oh, the sound of the Reapers is fantastic. I love the little beeps and boops the menus make when you save the game as well. Annoyingly, the oppression of EA tinges Mass Effect 3 and you can see some of the cut-backs that were made to get the game released on-time. In Purgatory for example the 3D bystanders in the distance are really low polygon and have no textures, the 2D ones standing next to them are worse, bad cut-outs of people floating to give the impression of movement and they do that classic trick of always facing the player. The general writing in ME3 isn’t as good as the previous games, voice acting is still great but I just feel general talk isn’t as clever as before. There are some fantastic moments that have been carefully put together. The ending of the first mission on Earth is really nice, the time capsule that Liara makes in your cabin was really calming and heart-warming. The ending of the Mars mission is great. The fights with Cerberus’s Kai Leng are well made. The scene with Garrus on top of the Citadel. I could go on, I think the actual moments and interactions with the people you care about since ME1 are the best in the series. And I think that’s much more important than some of the decisions you make. Must get to the elephant in the room; that ending. I won’t go too deep as there have been so much on it over the internet. Up until the last 15 minutes or so, I didn’t think it could be that bad but then as soon as your knocked as you reach the teleport to the Citadel the game changes. I don’t really know what to think of it, I definitely understand why there has been such a uproar about it. Its not only the fact it doesn’t take any of your decisions into account but it completely destroys their meaning by wiping the galaxy clean. It’s a big shame after the intricate and masterful way the Mass Effect 2 suicide mission was handled. The lack of explanation was very disappointing, like the Illusive Man just appears out of no-where to ‘wrap-up’ his story (badly). And what is with the child-god thing? The ending does make you think, I like that, but it’s no way to treat the fans who have poured so much time into the series with three lazy cutscenes. 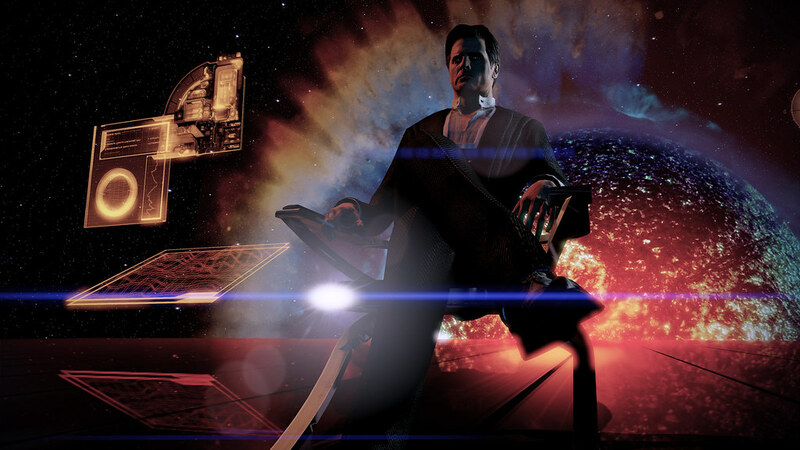 I would have loved an ending where the child catalyst wasn’t in there and you settled things with Harbinger and the Illusive Man face-to-face so something, the Reapers should have had more input. Reminded me of Deus Ex: Human Revolutions ‘ending generator’ machine; “push a button, get an ending™”. Also, multi-player. I only played it to get some knowledge on it at first, then I played it to increase my Effective Military Strength in the campaign. It’s a neat idea having it interlink with single-player, but only if the multi-player itself wasn’t so repetative. Since you don’t face-off against humans you have to fight AI enemies in waves like Horde or Firefight. But erm, you do that in the campaign anyway! It just doesn’t add anything. It was, however, a wise decision to have the achievements multi-player and single-player applicable. Images from Dead End Thrills.